The eclectic cheeseboard at Geoffrey Smeddle's The Peat Inn is an homage to the fantastic varieties found throughout Scotland. We take a look at twenty-five of the best varieties, perfect for serving on Burns Night. 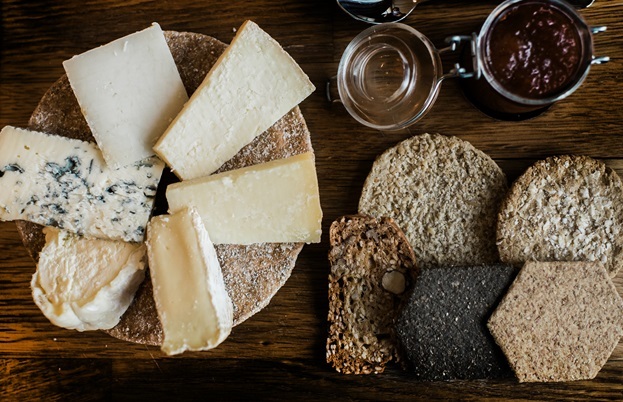 Every celebratory dinner is made just that extra bit special when a board piled with artisan cheeses is presented to the table after the main event, and Burns Night is no different. Once the haggis, neeps and tatties have been polished off and the last bowl of Cranachan has been cleared away, a few wedges of cheese are the perfect companion to a glass or two of whisky while dinner guests recite some of Robert Burns’ most famous poems. 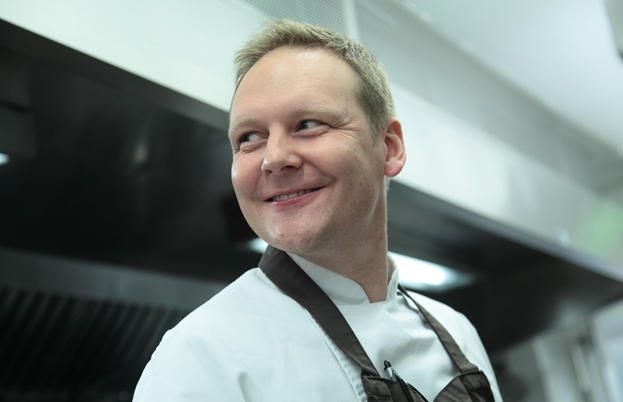 Geoffrey Smeddle is head chef at The Peat Inn, in Fife, and takes Scottish cheese very seriously. 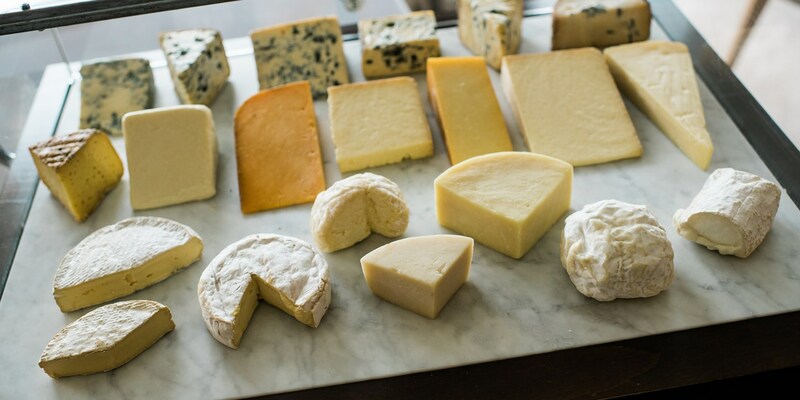 The restaurant offers around twenty-five cheeses at any one time throughout the year for guests to choose from, all of them made in Scotland. Here are some of Geoffrey’s favourites. Made by the Highland Fine Cheese Company in Tain, Ross-shire, Strathdon Blue is a multi-award-winning vegetarian cow’s milk cheese that’s rich, creamy and spicy. Think of it as a milder, creamier version of Stilton, with a peppery kick and large blue veins running throughout. This small square cheese (which used to be called Blue Monday) was developed by ex-Blur bassist-turned-cheesemaker Alex James, alongside cheese expert Juliet Harbutt and the Highland Fine Cheese Company. Made with rich milk from local herds, the bold blue veining lends a metallic note which contrasts beautifully with the soft, creamy texture. The UK doesn’t produce many blue cheese made from goat’s milk, but Biggar Blue is one of the best. Named after a nearby Borders town, it’s made by Errington Cheese, a producer known for its fantastic blues. The flavour is fresh, zesty and spicy, with a subtle blue tang. Errington Cheese’s most popular variety, Lanark Blue is made from ewe’s milk and follows a recipe that harks back to the Middle Ages. The flavour and texture varies massively depending on the season; during spring, the cheese is fresh and sweet, while winter wheels are left to mature for eight months, resulting in a powerful, pungent flavour. A strong cow’s milk blue with beautiful dark blue-green veining and a long, lingering aftertaste. It balances sweet, salty, spicy and tangy flavours with finesse, and matches perfectly with a glass of whisky. Made on the Isle of Mull, Hebridean Blue has lots of thin veins which add a strong, Stilton-like flavour to the creamy, rounded cheese. It’s aged for twelve weeks and handmade with traditional rennet. The only blue cheese produced on the Isle of Arran, this semi-soft offering from Bellevue Creamery is similar to France’s Bleu de Auvern and is made using the milk of the island’s own cow herds. One of the UK’s most famous cheddars, this particular cheese gets its unique flavour from the milk used to make it; the local cow herds are fed on fermented grain from the nearby Tobermory Distillery, which gives it a sharp, fruity tang. It’s also paler and whiter than traditional farmhouse cheddars. A very traditional cheddar made using animal rennet, starter cultures dating back to the 1950s and peg mills, which shred the curds in a specific way, lending a crumbliness to the final texture. Made by one of Scotland’s top cheesemakers, Dunlop Dairy, this hard cheese is smoked using oak shavings from Scotch whisky barrels. The cheese itself is nutty, mild and creamy, which when combined with the strong, earthy flavours from the smoking results in a fantastic, punchy finish. Similar to Wensleydale, Anster is made in Fife and has a dry, fresh, crumbly texture. It’s made to a traditional recipe and matured for just eight weeks. Lochnagar is named after a famous mountain in the Cairngorms near where the cheese is made, using a recipe almost as old as the landmark itself. Annatto is used to lend a vibrant orange colour before the cheese is left to mature for four months, giving it a nutty, savoury flavour. A firm, fresh cheese, Grimbister can either be eaten after just four days of maturing, or left a little longer to develop a lemony tang. It’s made in the same style as traditional Scottish farmhouse cheeses, which were always fresh and created to use up leftover milk after a day’s work. Campbeltown Loch is a pungent, strong-smelling cheese is washed during maturation in Campbeltown whisky, known for its unique smoky and saline flavour. This pungent, strong-smelling cheese is washed during maturation in Campbeltown whisky, known for its unique smoky and saline flavour. Made by the Inverloch Cheese Company, it is unpressed, giving it a light, bouncy texture, and the pungent rind gives way to a milder, cheddar-like centre. A mild Scottish version of the famous French cheese, Clava Brie begins life with a chalky, dry centre. Once left to mature, however, this turns into a silky, unctuous cheese that oozes onto the board once cut. The same cheese as above is lightly smoked over whisky barrel shavings, lending a flavour that contrasts perfectly with its subtle, creamy notes. A small, soft, white cheese that’s shaped like a pebble (hence the name), this is the newest cheese from Dunlop Dairy. Paddy’s Milestone is the local name for a volcanic rock out on the Firth of Clyde. Another offering from Dunlop Dairy, Aiket is made in the Camembert style using Ayrshire cow’s milk. When eaten young, it is fresh and chalky, and when left to mature it becomes smoother and creamier, gaining a mushroom-like taste. The Highland Fine Cheese Company’s Brie-style cheese is everything a soft cheese should be – creamy, smooth and sweet. Made in Wigtownshire by Galloway Farmhouse Cheese, this is a hard cheese with a beautiful red-tinged crusty rind. The mould-ripened rind gives way to a creamy centre dotted with little holes in this ewe’s milk version of Cairnsmore, which has a sweet, nutty and caramel-like flavour. A goat’s milk version of Dunlop Dairy’s Paddy’s Milestone, this little cheese melts in the mouth and has a fresh, goaty flavour. Similar to Aiket, this log-shaped goat’s milk cheese is perfect for slicing and grilling for salads. It has a smooth, creamy texture with a mild tangy taste. A classic Brie in terms of texture and appearance, but the inclusion of ewe’s milk means it has a much sweeter, rich flavour than cow’s milk alternatives. Also known as Jezebel, this is the goat’s milk version of the Highland Fine Cheese Company’s Brie. It has an unmistakable goaty tang and lighter, milkier texture, with a pretty, bloomy rind.